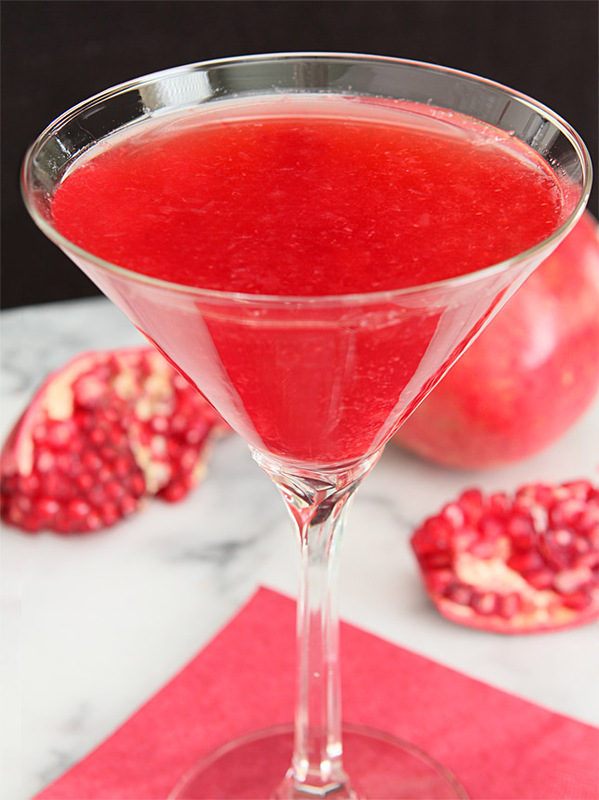 Imperial Pomegranate Cocktail – Perfect for the Holidays! As much as I love the abundance of fresh produce during the summer and lament the wane of warm days I can’t deny I get excited about three things as the end of tomato season comes upon us. Pumpkin? Not really. Winter squash? Nah; I like it OK but I don’t get excited about it. My three winter loves are much more exciting and vibrant! Cranberries, pomegranates and all things citrus brighten my day and my taste buds and as I’ve headed into cocktail territory I’ve found that all three are equally amazing in the creation of cocktails that are both easy on the eyes and in going down including this Imperial Pomegranate Cocktail. 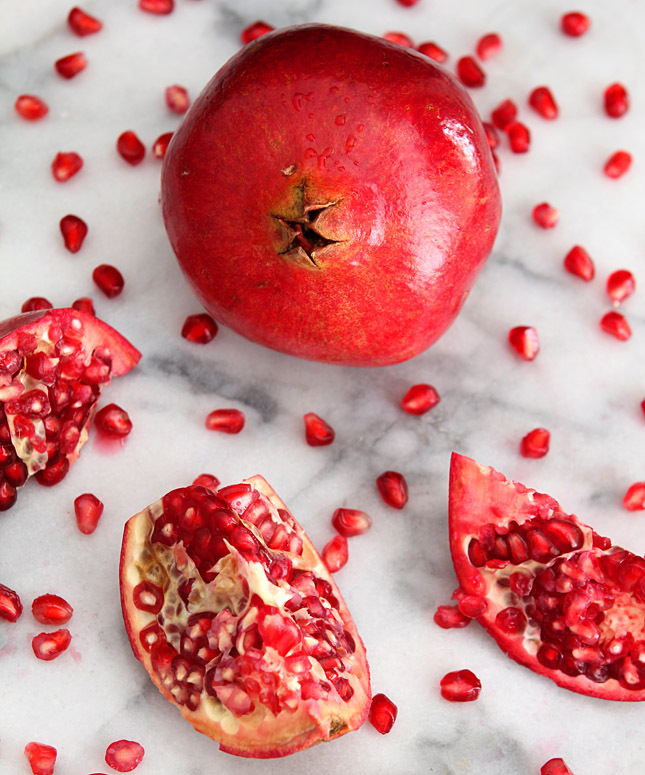 If you’re still leery of pomegranates and the hassle they can be to remove the arils from their cavern like little homes, take a peek at this post…it really is SO easy and virtually no mess to separate the arils from the membrane when you’re doing it underwater. Promise. While there, check out that recipe for a cream cheese filled French toast that is garnished with pom arils. Want it now! Pomegranates are only available from September through February so I pick one up almost every single time I’m at the market; I only wish I could hoard them all year! I’ve heard the arils can be frozen…anyone tried that with success? Mushy arils would not be fun! I was recently contacted by a rep for New Amsterdam Spirits wanting to know if I would like to sample their gin? If you think I always say yes to this type of offer then think again…I really don’t. Some cheap vodkas with a bevy of ridiculous flavors (Cake? Salted Caramel Popcorn? Really?) never get a go. Anything that appears to be marketed to a ‘younger than 21’ crowd is not only not going to get my stamp of approval for that reason but the truth is it’s usually subpar product anyhow. I won’t mention any names but I seriously was offered something with a tobacco flavor. So Not Kidding and SO gross. Still, on the plus side I’ve been fortunate to be on the receiving end of a bounty of great ‘adult beverages’ and this gin ranks right up there with the best of them. I’m not claiming it as the best gin in the market but combine it’s taste with it’s price point and it’s going to be a staple in my bar. I’m not much of a straight gin drinker and I’ve sometimes grimaced at paying what I do for Bombay Sapphire because I know it’s name. Now I won’t have to! This is definitely a citrusy gin; not that it doesn’t bear the standard aromatic of juniper and has some nice floral notes but it’s the citrus that reigns supreme; the disinfectant nose that can really hit you with gins in this price point was all but gone; it was the citrus that I noticed front and center. Seemed the perfect choice for a cocktail featuring the brightness of citrus and the tang of pomegranate. I will sometimes ask a brand rep if they can provide me with a recipe and I did this time for sure. My creativity as a mixologist is all but gone while I juggle the last minute throes of finishing my home and HOPING I’ll be moving in a week or so. Still I sure needed a good drink. 🙂 My thanks to mixologist Darryl Robinson (host of Cooking Channel’s Drink Up!) for this recipe. It sounded interesting but I really was not prepared for how amazing it tasted when all of the components came together. I didn’t have any Pomegranate liqueur on hand though or even pomegranate juice so I subbed with some sweetened cranberry juice. It was so good I’ve revised the recipe accordingly; no reason to run out for a bottle of liqueur you don’t have or will seldom use. If you have it? Sure, then use it! As ready as I am to move (OK, beyond ready), I am going to miss one thing from this experience. Well, three things actually. OK, four. Augi, the little dog that lives here has fallen in love with me and me with him…he is going to be hard to leave and I’m certain he is going to miss the regular treats I give him. I won’t miss his hair all over my stuff though! Still, mostly I am going to miss Priscila, Nate and their four year old daughter Lena. They live across the street and have lived at the bottom of my street for SIX years but we never met until this past summer. Their home and friendship has been a nice respite in those moments when I just had to get out; we’ll sip a cocktail or two (OK, maybe three!) and chat and cook a bit and I just love their company. Lena? She is adorable, precocious and best of all? When she sees me, she runs up screaming, ‘BARB!’ Who doesn’t love having someone be SO excited to see you appear. It will be nice to invite them to my new home and I will always be ready with one of my cocktail adventures for them to sample. My friend Shanna over at the Pineapple Coconut Blog claims the same love for my favorite winter components and we wanted to offer you two cocktails this week; mine with pomegranate and hers featuring cranberry. Hop on over and check it out, tell Shanna Hi for me too…and as always…Cheers! 1 oz. sweetened Pomegranate juice or Pomegranate Liqueur if you must! Combine all ingredients in a cocktail shaker filled with ice. Shake and strain all ingredients into a chilled martini glass. Garnish with pomegranate seeds. Simple rule for simple syrup. Equal amounts of water are mixed with sugar until the sugar is melted. The problem with that basic recipe is that unless you keep a supply on hand you will have to wait for it to get cool. Add 1/4 cup ice cold water and stir. Done and done! sounds really festive and delicious!!!! I’m so with you–my 3 favorite things are pom, citrus and cranberries! Thanks for the great gin rec! I’m a total gin girl. Thanks for eschewing tobacco flavored booze. And salted popcorn. I’m still mad at Jelly Belly for those popcorn flavored jelly beans. Beautiful Barbara! As a gin lover, I’m going to have to give this a try. I made them again last night…they are hard to discern what to expect but thus far EVERYONE has loved them! And the hits just keep on coming…. wow, love pomegranates and you have showcased them in a new light here, Barbara. I think I might have to get into the habit of a Friday night cocktail, just so I can sample all these beautiful creations of yours! Love the snaps, too! Just gorgeous. Gorgeous! The color is stunning and your photograph is your usual top quality– it doesn’t look at all like your photography things are in storage. you pulled it off! Can’t wait to see your new photography room in your new home. Simply heaven! This is a nice drink – I can already taste it. I think. 😉 I’m a fan of citrus any time – I should try this gin. Never got around to buying a bottle (so many gins, so little time). And I do happen to have some pomegranates in the house (plus plenty of pomegranate grenadine, although that would probably be too sweet for this drink). This is nice – thanks. The photo of the pomegranate and seeds on the snow is beautiful! Perfectly bright and cheerful looking cocktail for the holidays. Dogs and children are the best companions! Hoping you and little Lena are able to see each other once you move into your new home. Looking forward to hearing that you received the keys!! Lena already has a room at my house. She just provides me with so much joy; it’s reminiscent of my little girls. I miss them a lot…the older mine get the snarkier too; of course I wish they were little and sweet! What a lovely cocktail for the holiday season! You must be so busy getting ready for the move. I don’t know how you get it all done. I got it all done because I had to get all my pics before Emily moved on 12/4. Now that the house is delayed I might be in trouble as I go through what I had ‘canned’ but life will go on. I can only kill myself a certain amount right? Closing has been delayed til after Christmas; I’m going to have to find a way to take a photo where I’m staying. Easier said than done!